Having too many coats of stain on a hardwood floor can make the wood look dark. When tastes change and you want to refinish the hardwood floor so the wood appears lighter, you must first remove the previous finish and old stain. Lightening a hardwood floor is a time-consuming project requiring certain techniques and tools. Fortunately, this job is relatively inexpensive compared with hiring a flooring contractor. Lighten a dark hardwood floor by sanding. Remove everything on and around the hardwood floors, including rugs and furniture. Sink all nails popping up from the surface of the hardwood floor with a nail set and hammer. Placing the nail set on top of the nail head will prevent the hardwood floors from denting from the force of the hammer. Open all windows in the room. Affix a 60-grit sanding pad to a drum sander. Tilt the sanding base off the floor, beginning at the farthest corner, and turn the machine on. Lower the sanding base onto the hardwood floor and work the drum sander with the grain of the wood, sanding in overlapping rows from one end of the room to the other. Continue to use the drum sander and the 60-grit sanding pad until the hardwood floor begins to lighten significantly as the stain comes off. Attach a 60-grit piece of sandpaper to a palm sander, and use it to sand the edges and corners of the room. The palm sander will reach areas of the hardwood floor the drum sander couldn't reach. Repeat the entire sanding procedure with the drum and palm sander, using 80-grit sanding pads, and then 100-grit sanding pads. Vacuum all of the sanding dust created by the drum and palm sander with a shop vacuum. Use the vacuum to cover the entire area of the hardwood floor. Remove sanding dust unseen by the naked eye with a tackcloth, wiping the entire hardwood floor. Apply a lighter-colored wood stain to the hardwood floor, using rags. Dip a small corner of the rag into the desired wood stain, and wipe the rag over the hardwood floor to distribute the stain. 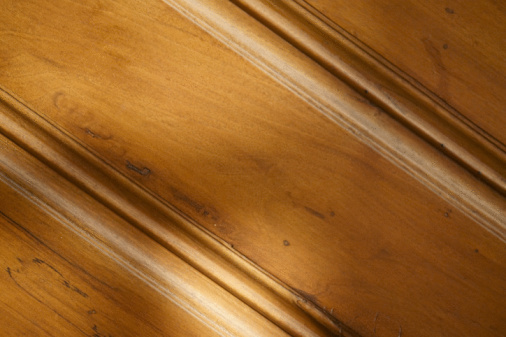 Use long and even strokes when wiping the wood stain onto the hardwood floor, remembering to work with the grain. Continue to apply the wood stain until you have covered the entire hardwood floor. Allow the wood stain to dry up to four hours, or overnight depending upon the included label directions. Seal and protect the hardwood floor by applying an even coat of polyurethane finish. Use a floor finish applicator to brush the finish onto the floor, using long, even strokes and working with the wood grain. Allow the polyurethane finish to dry for up to four hours. Sand the hardwood floor lightly to remove air bubbles that have dried within the floor finish, using a pole sander and 100-grit sandpaper. Vacuum the hardwood floor with the shop vacuum, and use a clean tackcloth to remove any remaining dust. Apply an additional coat of polyurethane finish to the hardwood floor, using the floor finish applicator. Allow the finish to dry overnight.